I’ve spent the last few years hugely frustrated with the world we live in. It was always difficult to define my disappointment in all the things I had believed to be true about the world and the possibilities in store for us all until I watched this. Ken Robinson put it well when he said “creativity now is as important in education as literacy and we should treat it with the same status.” All kids have tremendous talents and we squander them. I have a strange set of skills. I am quite good at maths and but I also have an all-consuming passion for dance. If asked which I would rather spend my days doing, what would you think I would say? Given the choice, I would love nothing more than to hone my art of tap dancing, while training classically in ballet, music and jazz. And yet this option was never feasible for me, because I was also good at maths. It was never an option that I would waste this “gift” that was going to give me a great job, career and hence life. This gift has, more often than not, been a burden. There have been countless times in my young life where I have wished (and I’m embarrassed to admit this) and wished that I had been born without half the capabilities I have. Then and maybe only then would a career doing what I love have been feasible. I believe this to be a very sad depiction of the society we live in and what we value. In a technology driven age, children are encouraged more and more to be good at maths and coding. Don’t get me wrong, this is great and sets kids up from a very young age to be independent, entrepreneurial and very much employable. But on the flip side, what does this say to children who are not naturally gifted at Java and C++? It tells them that they are not intelligent and that their talents are not as valuable to society. This is wrong. In fact, I would argue that far fewer among us have the capabilities and thought process to be truly original creators of art, in all its forms. Coming back to Ken Robinson’s speech, if you’re not prepared to be wrong you’ll never come up with anything original. How do we expect our children to ever create anything new and original, if we don’t let them create to begin with? It’s time that we changed the rules. It’s time that we let kids learn what they want to learn, and create what they want to create and value every talent that each child possesses. Maybe then we will see less children suffering from panic disorders and self-esteem issues, and less young adults who are totally unfulfilled in their lives. Who knows, maybe then Ireland will become the country we all want to live in, a place to be proud of, a country that actually makes money and produces the music, stories and culture that we are so famous for. Maybe in years to come, there will be a chance for a little girl like me, who loves to tap dance more than solve differential equations. Well done to everyone who performed in our Christmas showcase! You were all fabulous and we’re so proud of you. Hard work really pays off! What to bring to my first Tap Class? I get a lot of people asking about tap shoes, and if they need to go and buy them right away, or if they can come to class without them. Of course you can! The most important thing is to wear shoes you’re comfortable in, and preferably shoes that have a hard sole and make a sound. Brogues, boots, character shoes etc are all perfect! The only other things to bring are a bottle of water and your ears! After your first class or two, (when you think to yourself, why haven’t I been tapping my whole life??) you might decide then is the right time to venture to buy some taps. There are many to choose from. Capezio are my personal favourite at the moment, but unfortunately I’ve yet to find anywhere in Dublin that stock them. Bloch are the next best choice for me, and Dance World on Parnell street have some lovely helpers that will look after you. 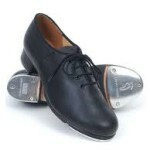 Tap shoes are easy to fit, as they should feel pretty much exactly like your normal shoes do! Not too loose, not too tight and with a bit of support. 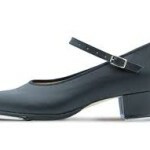 Girls have the option of getting heels, or going with the more brogue style. I like the brogue full shoe style right now, because it’s giving me a fuller sound. The best thing about tap shoes is that they last a really long time! I’ve had the same pair of Bloch lady’s taps for about 10 years. They’re a bit worn at this stage, but they’ve served me well! The cheaper models won’t last as long, as the shoe itself will wear down, but for a beginner’s shoe they’re perfect. The unfortunate thing is once you’ve bought them, your normal shoes will feel waaaay too quiet! You might want to warn housemates and family about the new music that will be filling the house, because you won’t want to take them off! If you can walk, you can tap. Since September, I’ve been teaching a new group of kids in Ozanam House, all under the age of 11. We’ve been working on some jazz, some musical theatre, and some ballet. As expected, there were some kids who were natural dancers, some kids who went home each week and practised really hard and came back fighting, and some kids who loved coming to dance class just to see their friends. 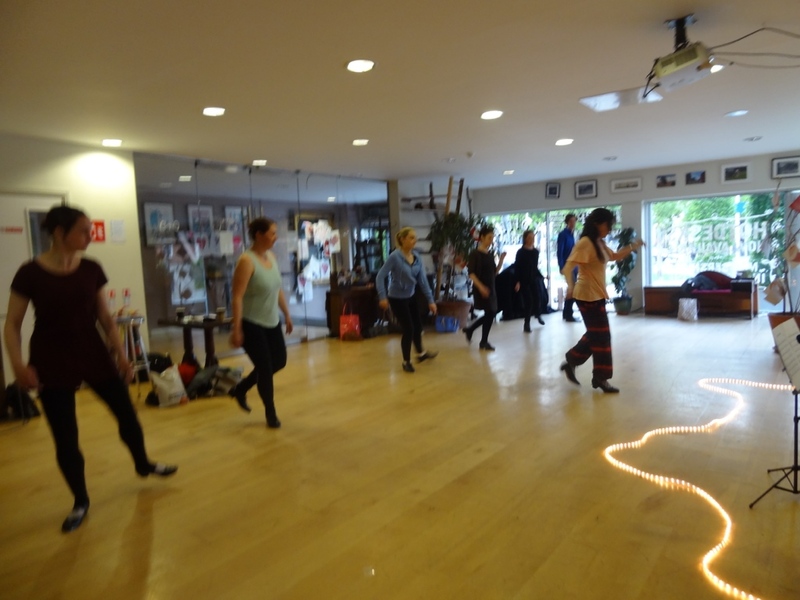 5 weeks ago, we started tap class. Most of the kids had never seen tap shoes before, and so when they put them on for the first time, I let them loose. They could do whatever they wanted. The smiles on their faces were totally worth the 5 minutes of mayhem that followed. Their smiles said “I can make as much noise as I want?? ?” What followed was a beautiful disorganised crazy cacophony of sounds as they explored what taps felt like. Now that we’re on week five, they all know what a flap is, and a shuffle and a cramp roll. They can clap to 8 and (mostly) stay in time. And the children that hadn’t much of an interest in actually dancing in dance class all of a sudden are some of the most natural tappers in the room. Ozanam House is not a stage school – it is a place for children in the community to come and enjoy themselves with their friends on Saturday mornings and learn something new. So how is it that children with very minimal dance experience have taken to tap dance so well? For me, it proves what viagrasansordonnancefr.com Buster Brown used to say “if you can walk, you can tap.” Tap is the every-man’s dance; you don’t even need special shoes if you’re really old-school! A dance that’s based on improvisation, individuality, style and stealing steps means that there is never a mistake in tap. One of the best pieces of advice I ever got as a tap-dancer was from Heather Cornell. She said if you make a mistake, do it again. And then do it again until it becomes part of the music. This is something I go back to time and time again – our mistakes are what make us human, they are what make us original as dancers. For a six year old child, tap-dancing is like noisy walking. For someone like me, who has tapped for over 20 years, tap is as natural as walking. The challenge arises in the middle, when we worry about what we sound like and who is watching, and instead of embracing our mistakes as lessons, just answer “oh, I can’t dance.” I say yes you can. I say episode choose your story hack own your mistakes. I say if you can walk, you can tap.